Garrett Hobbes is the second pirate for the daddy person in our house. 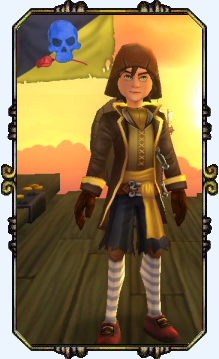 While becoming addicted to Pirate101, Garrett found himself skipping some of the side quests with his first character. He decided to create Garrett Hobbes to start again and this time, complete all the quests along the way. If you have a new Pirate, it’s a wise idea to complete those side quests. First off, many of them are fun and if you pick up on the varying references of names or places to real world events, you might even get a little giggle. But side quests also provide you with needed experience to level up and increase the strength and abilities of your Pirate. They also provide rewards from money, equipment and most importantly Companion training points! So take the time to complete those quests, even if they don’t help you progress through the big quests to the next world. Garrett’s parents were said to have been Shipwrecked while traveling aboard a royal Marleybone cruiser on holiday. 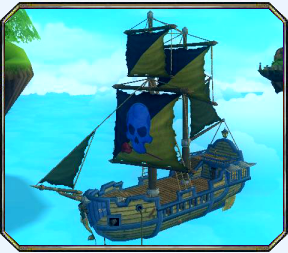 Hint: If you’re a pirate with your own ship, never take a cruse on someone else’s ship! He was raised in the Skull Island skyway, bouncing around from Skull Island itself to Jonah Island where he learned the skills of a privateer from Gullet Family headed by the Frogfather. 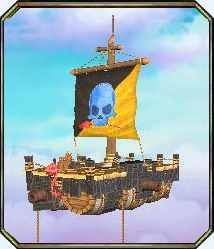 His ships flag is an eerie blue Jolly Roger clinching a blood red rose in his gnarly teeth. As with all Privateers, watch out for this pirate. He’ll make you think you’re getting a good deal and that it was completely your idea to give him all your treasure and gold. 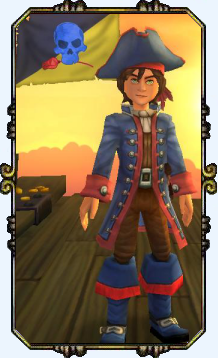 Garrett is currently a level 8 Privateer. He is currently Pirating in Skull Island with his first mate, Egg Shen. Keep up to date with his adventures through the Captian’s Log. 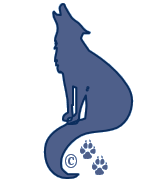 © 2013 A Pirate’s Portal; Springwolf, D.D., Ph.D. All Rights Reserved.